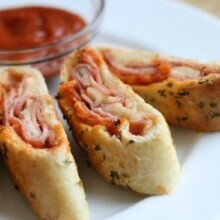 Do you know how to make Stromboli? Get this step-by-step tutorial on how to make this pizza-inspired appetizer! Preheat oven to 500 degrees. Line large rimmed cookie sheet with parchment or spray lightly with non-stick cooking spray. Spread pizza dough out on baking sheet to be approximately 10x16. Spread pizza sauce over 2/3's of the dough lengthwise, leaving a 3x16 rectangle of plain dough along one of the edges. Top sauce with half the grated cheese, salami and ham. Top with remaining cheese. Brush the plain strip of dough with the egg. Fold in the sides about an inch and brush them with egg. Roll up like a jelly roll lengthwise starting along the long edge of dough topped with all the fillings and ending with the plain strip of dough on the bottom of the roll. Brush the entire stromboli with egg and gently cut slats in the top of the dough every 1-2 inches. Sprinkle parsley and cheese over top and bake in the lower third of the oven for 8-10 minutes or until bubbly and golden. Remove from oven, cool 5 minutes and slice into pieces. Serve with more pizza sauce. If your stromboli burns before the inside is baked, your oven may run hot! Be sure to bake stromboli in the lower half of the oven for best results.